In the early spring of 2010, Sam and I had a chance to make the trip of a lifetime to California, and more specifically, Death Valley National Park and the incredibly scenic Highway 395 which runs from south to north at the foot of the majestic and snow-capped Eastern Sierra mountains. We were fortunate to see Death Valley at a time when Mother Nature was doing her transitional thing, flooding the lower elevations of the park to create rare and spectacular conditions. We enjoyed the contrast of warm, desert temperatures and then the sub-freezing landscape in the shadow of the Eastern Sierra. From the Owens Valley we watched the sun rise and illuminate Mt. Whitney, the highest mountain in the contiguous United States, we heard coyotes yelping along the shores of Mono Lake, and we were genuinely awed as we gazed up from the salt pans at Badwater (242 feet below sea level) toward Telescope Peak towering 11,049 feet above. Lots of great memories made, and here’s a little slideshow I put together when we got back. As you will notice, the soundtrack is definitely original. I wanted to create a lasting memory of the trip Sam and I took out to California, something that would be accessible to us and anyone else we wanted to share our trip with. Of course the blog is a nice mechanism for doing this, as are online hosting sites like Flickr and Vimeo, but not everyone is as excited about logging on and surfing the net as we are. Searching for a more accessible alternative, one that could be enjoyed the old-fashioned way by holding it, I settled on using the “book” option within iPhoto to assemble and publish a hardcover, dust-jacketed, 10 x 13 book. I did some research on other online self-publishing options such as Lulu and Blurb, but settled on iPhoto largely due to the ease of use. Regardless of the tool you use, there are many options regarding size and shape, with beautifully designed templates making the compilation process very smooth. Choosing and arranging photographs was as simple as drag and drop, and the process of adding and editing text was easy. I have been checking the FedEx tracking site almost every day since ordering, anxious to know when the finished product was going to arrive. The anticipation of seeing a printed journal of the adventures that Sam and I shared together has been very real for me, and much more intense than I had expected. On order for about a week, the book – “Californiadventure” – arrived today, and I can happily report that I am absolutely thrilled with how it turned out. The quality of paper and printing is OK, but the overall production of the book – especially the dust-jacket – gives it a very nice feel. If you were to visit your local bookstore and find a copy of this book on a shelf there, the quality is such that you would probably never know it had been self-published. As much as I enjoy the benefits of working and displaying images digitally online, there is something permanent and “real” about our book, so when we close the lid on the laptop and rejoin the analog world, this book will always remind us of the wonderful Californian adventure we shared together. Our original plan had been to stay overnight in Lee Vining so we could shoot at Mono Lake again, this time in the morning, but since the road hadn’t been plowed we didn’t want to have to hike in – especially in the dark with the coyotes around! Instead, we hopped in the car and drove south to Lone Pine for the night, planning on seeing the picturesque Alabama Hills area in the morning. We were greeted with a beautiful though cloudless morning and the imposing height of a snow-capped Mount Whitney towering above us. 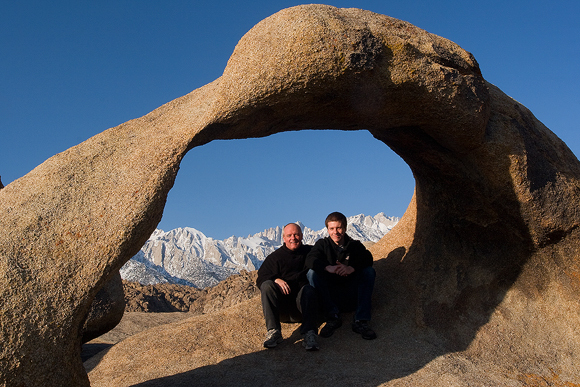 The Alabama Hills is a really cool area, one that has served as the backdrop for many movies and TV shows. 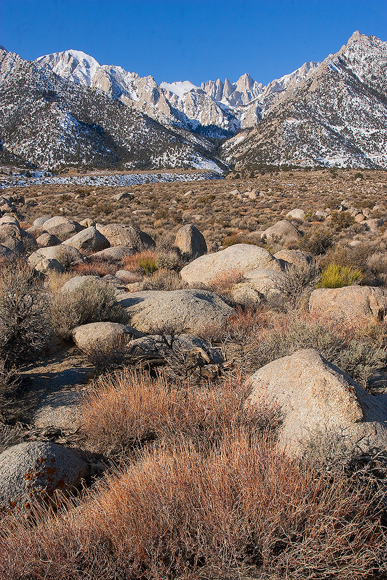 There are all sorts of round boulders mixed in with the dusty landscape that rises up from the floor of the Owen’s Valley. There are also some famous, and not so famous, arches scattered all over the area, and we had a great time exploring the area and enjoying the morning. After this we are heading back to Death Valley… the weather is supposed to be exceptional for the next two days, and these two Mainers want some summer temperatures in February! Thanks to everyone who followed me on this trip. I appreciate your support, and have enjoyed interacting and sharing the preparations, experiences and photographs from what was an awesome trip. I had a wonderful time both in person in California, and virtually here in the blogosphere. I am probably going to self-publish a book from this blog to help remind me of the experiences I had. A print run of one – aren’t Web 2.0 tools amazing! Not entirely sure what online publisher to use, so if anyone has any recommendations, they’d be appreciated. Thanks again to everyone who viewed and commented on this blog. I had a great time and am looking forward to the next big trip… the 17-day family vacation this summer to California to see the Owens Valley, Yosemite National Park, San Fancisco, and Big Sur… should be a blast, and of course I will be bringing my camera gear. More from the Alabama Hills area. A very distinctive landscape, this area was named after the CSS Alabama by prospectors sympathetic to the confederate cause. Many movie scenes and TV scenes have been filmed in this location. Among others, The Lone Ranger was filmed here, along with scenes from Gladiator, Tremors (classic movie if you haven’t seen it), Gunga Din, and How The West Was Won. Trivia courtesy of my favorite encyclopedia… Wikipedia. 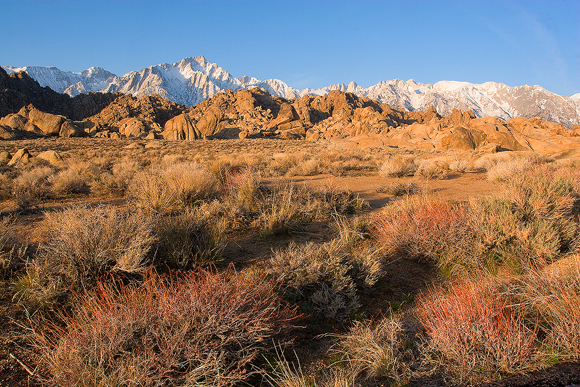 Another early start… this time from the town of Lone Pine and heading up into the Alabama Hills. I had decided to make a detour about an hour and a half north of Death Valley to try to see this place. I have seen many images of the area, and it seemed like it would be well worth seeing in person. I was not disappointed. I left the hotel room at about 5:00am… after yesterday evening’s debacle with losing the light, I was determined not to get lost this time and risk something similar happening. I had seen images of this arch many times… and although a photographic icon, I wanted to see it for myself. Sometimes called “Galen’s Arch” after late renowned landscape photographer Galen Rowell, it is located in the foothills of the Eastern Sierra, right under the imposing and beautiful Mt. Whitney. I had the place all to myself, and before sunrise I truly do not think I have ever witnessed a darker and more impressive night sky. I swear I saw the Milky Way, and I know I saw several shooting stars. Mt. Whitney is 14,505 feet tall, and as the sun rises and kisses it with morning light it is indeed a sight to behold. Some of the images I have seen from this location include a warm, almost alpenglow on Mt. Whitney… no such light for me though. However, even though it is late March, there was still a wonderful coating of snow all across the higher peaks, and that definitely made for a special experience for me. Anyway… more to come from the Alabama Hills area later. I don’t have that much time to edit and post-process right now because I want to hit the road and head toward Death Valley. Yeehaaa!